Matilda was born with a condition that makes her eye lenses detach progressively, giving them a glassy ‘alien’ look. 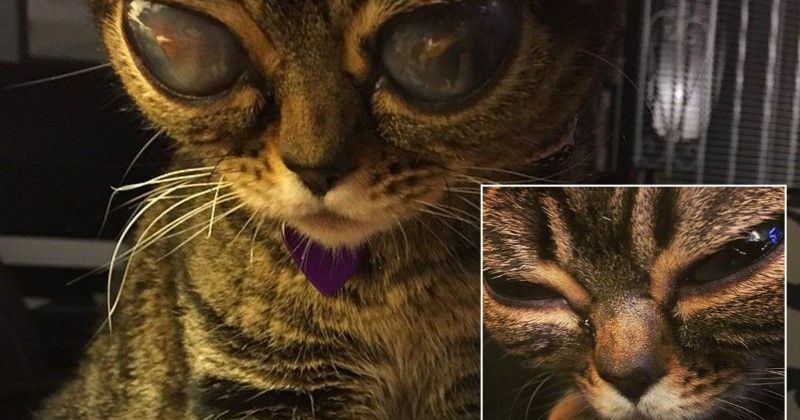 Meet Matilda the ‘alien cat’ – whose huge dark eyes have made her an Instagram star. The two-year-old has amassed more than 30,000 followers after her eyes became enlarged and glossy as a result of a medical condition. Matilda, according to her owners, has a rare condition called lens luxation, which caused her eye lenses to spontaneously detatch. The now-blind moggy is not in pain, according to her website, which explains her life and condition. After months of fearing for their new kitten, Matilda’s unnamed owners rushed her to various vets when her pupils would regularly enlarge. However, vets assumed ‘The Lady’ was “crazy”, according to the poorly puss. The website reads: “Searching for answers, The Lady contacted the rescue society that Matilda came from to try and solve the mystery. After much deliberation and weeks of anxiously awaiting test results, Matilda’s ‘servants’ finally succumbed to not putting their kitten through surgery and decided she could be happy and healthy with the condition.